Here’s the latest sales report from Media Create (and Famitsu), covering Week 5, 2019 in Japan. This week, there’s a few entries in the Top 20 from Media Create, including some Nintendo Switch games. 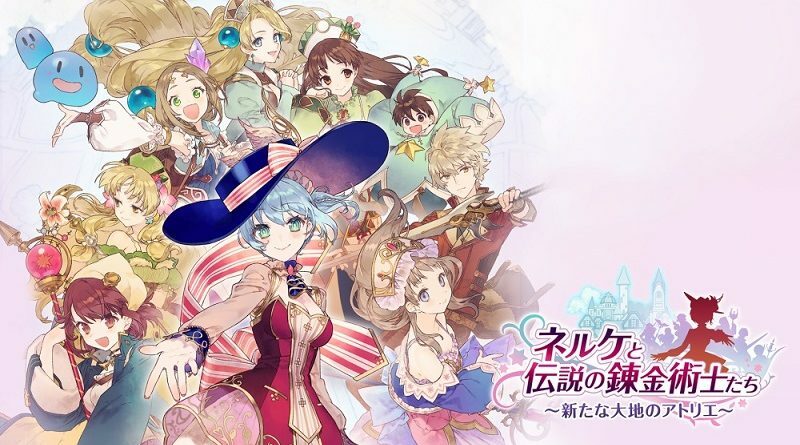 Nelke & the Legendary Alchemists: Ateliers of the New World is off to a rather lukewarm debut, with about 31 000 units sold across all platforms. The Nintendo Switch version only accounts for 8 046 units, twice less than the PlayStation 4 version (the leading version). It will most likely be gone from the Top 20 within a couple of weeks, as this kind always tend to sell the most during the first two weeks, and this Anniversary title doesn’t seem to have generated much excitement among fans of the series. Last week, Media Create reported a 50% Day 1 sell-through for Dragon Marked for Death, but as expected, the shipment was rather small. The game sold about 4 500 units at retail during its launch, which remains a rather decent performance for an independent game. It’s pretty much guaranteed to have sold more on the Nintendo eShop (in part due to the fact it’s cheaper there), though we will most likely never get exact data for it. The game will be gone from The Top 20 as early as next week. Unfortunately, Fate/Extella Link sold pretty poorly on Nintendo Switch, with only 4 134 units in 4 days. Not only that’s nowhere near what the PlayStation 4 and PS Vita versions sold at launch (over 120 000 units combined), it’s also even worse than Fate/Extella: The Umbral Witch, which sold over 10 000 units at launch back in 2017 (though it included all the DLC, which is most likely why it sold over twice better). While it’s clear the Fate audience is not (primarily) on Nintendo Switch, it’s certainly not with full price late releases that Marvelous is going to attract fans and newcomers on that new platform. As for ROBOTICS;NOTES DaSH, it has one of the worst opening ever for 5pb’s Sci-fi ADV series, with 3 943 units on PlayStation 4. The Nintendo Switch version did not even chart, which means it sold less than 3 613 units. ROBOTICS;NOTES Elite did not chart either. While the new releases in the Top 20 from Media Create failed to impress, that’s not the case of the usual evergreen titles on Nintendo Switch. Take New Super Mario Bros. U Deluxe for example: it sold 45 879 additional units this week, which is a rather soft drop for its 3rd week on the market (-21%). It’s now sold 358 748 units since launch, and it should have no trouble reaching 500 000 units by the end of this quarter (or in April at the very latest). And after enjoying strong sales at launch and during the holiday season, Super Smash Bros. Ultimate is enjoying nice and steady sales in Q1 2019. It sold 35 217 additional units this week, bringing the total to 2.8 million (2 799 969 to be precise). It should be able to reach 3 million units by the end of the quarter, or in the first weeks of April at the very latest. This week, Media Create report a significant increase in sales for Pokémon: Let’s Go, Pikachu! / Let’s Go, Eevee!… +128%, which is highly unusual (especially during a slow period like February). The reason sales jumped to 21 274 units this week is because of the re-release of the Nintendo Switch bundle (only sold at launch, in November), which also had a noticeable impact on Hardware sales. It’s not clear how much of an impact this will have on the game’s sales from Week 6 onwards, but it’s pretty safe to expect them to go back to more “normal” levels pretty quickly. As for the Super Mario Party and Mario Kart 8 Deluxe duo, they’re doing pretty well. They basically sold the same amount: 12 181 units (+2%) for the former, and 11 710 units (+8%) for the latter. The longetivity of Mario Kart 8 Deluxe is certainly a sight to behold (2 108 522 units LTD), which would make anyone doubt this was “just” a port of Wii U game instead of a brand new entry! Unfortunately, Super Mario Party didn’t quite reach 1 million units this week: it missed that milestone by less than 4 000 units (996 084 units as of Week 5). Finally, Minecraft sold 8 250 units during Week 5: that’s less than during the previous week, but sales were nearly flat (-4%). 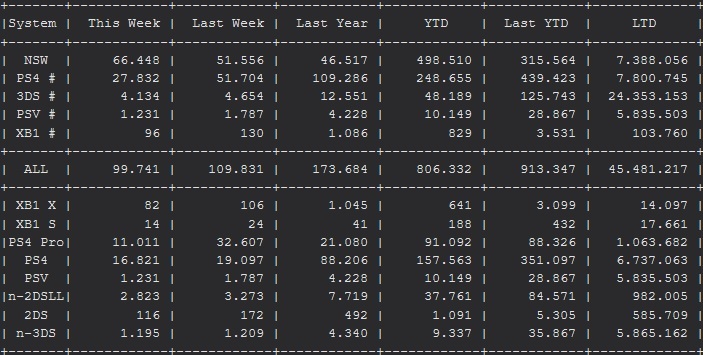 It’s getting pretty close to the 600 000 units milestone: only two weeks left (590 289 units as of Week 5)! 12./10. [NSW] Splatoon 2 (Nintendo) – 7.689 / 2.918.368 (+5%). The road to 3 million is a long one even for Splatoon, but the goal is in sight! As mentioned above, the re-release of the Pokémon: Let’s Go, Pikachu! / Let’s Go, Eevee! bundle led to a noticeable increase in sales for the game itself, but also the console. Nintendo Switch sales nearly topped 70 000 units this week (69 472 units to be precise), which is definitely not the sort of increase you would expect during a slow week without any major releases. Unfortunately, just like the one on Pokémon: Let’s Go, Pikachu! / Let’s Go, Eevee!, the impact on Hardware sales is most likely going to be limited (because it’s unlikely the bundle is there to stay for months). However, that does not mean sales will drop like a rock starting next week or anything. It’s pretty safe to assume they will remain in the 40-60 000 units range in the foreseeable future. In comparison, the Nintendo Switch sold about 49 000 units during the same week last year, so it’s another week with an increase Year on Year. 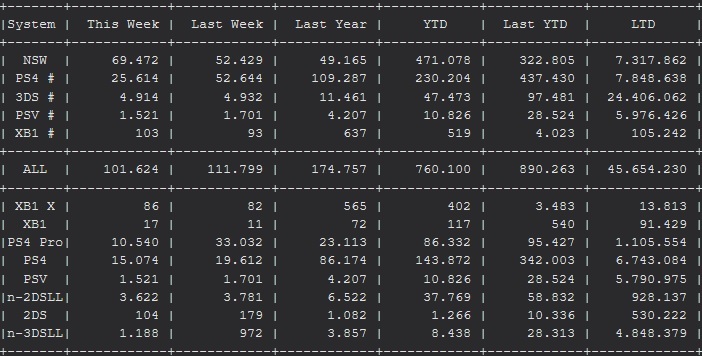 As a result, total sales for 2019 so far are quite a bit ahead of 2018 sales after the same amount of weeks: 471 078 vs 322 805 units. Even if 2019 sales were to start lagging behind, it would take a little while for them to drop below 2018 sales. Unfortunately, the line-up for February and March is a bit lacking in the big hit department (and the only first-party game is Yoshi’s Crafted World in late March), though at the very least it’s definitely not lacking in games. The many new releases should help sustain sales, though it’s unlikely there will be other major increases like the one this week. Finally, Nintendo 3DS sales are perfectly flat, with 4 914 units sold… barely 18 units less than last week (no, we didn’t forget a couple of 0s here! ).